Rome is a beautiful city that magically attracts tourists from all over the world. Many people come here either to admire the remnants of ancient Rome from the Colosseum to Trajan’s Column, whist other come to admire St Peter’s Basilica and the Vatican Museums with their art treasures unparalleled in the world. Still others come as pilgrims to the capital of Christianity or to see the Pope. However, Rome is one of the most religiously and culturally important cities in the world. As beautiful as Rome may be, with regards to its nightlife there are relatively few clubs and pubs in comparison to other cities such as London or Paris. This is certainly not to say that Rome has nothing at all going on. There are just comparatively fewer night-scenes than in other world cities. The main reason for this is not related to the fact that Romans ‘go to bed with the chickens’ as the saying goes, rather it is due in part to the fact that Rome is a southern city with hot weather and long, dry summers. As a result much of the city’s nightlife is taken onto the streets and squares; a habit that is strange to cold and rain-plagued central Europeans and which sometimes gains their envy. Hence in Rome for example the northern part of the Via del Corso is known as a promenade. The name of the street is reflected amongst other things in the term ‘Autocorso’ – the joyful, spontaneous car parade that takes place after victorious football matches; something that has recently spread to Germany. By the way, most of these clubs and other hangout places are often close to holiday apartments in Rome and other accommodation sites in the area. Because of this, tourists who want to make the most out of their vacation would not have a hard time looking for a place to party and enjoy to the fullest. Next to the above mentioned street in Rome the area around the Spanish Steps and the Piazza di Spagna is a popular meeting point for roman youth. The craze goes on throughout the entire Trastvere district. In this district across the Tiber, with its numerous narrow alleyways and squares there are countless street cafes, pizzerias and small restaurants where locals meet and feel comfortable. Many tourists like to join them as the area is not as overcrowded and over-priced as the city centre or the restaurants and bars in the vicinity of famous sights. Finally it is not without reason that the English have the well known saying ‘when in Rome do as the Romans’. Of course Rome does also have clubs; one of the best and most famous of these is the ‘Alien’. 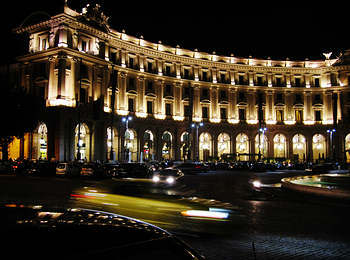 It is one of the best locations in Rome in which to dance the whole night through. The ambience is oriental and far eastern and the music mainly Hip-Hop or House music. Incidentally the dress code in most roman clubs is smart and often requires men to dress in a jacket and tie. Women should also dress elegantly – the more elegant the better. The ‘Alien’ on the ‘Via Velletri’ 13 and can be reached via bus route 38. 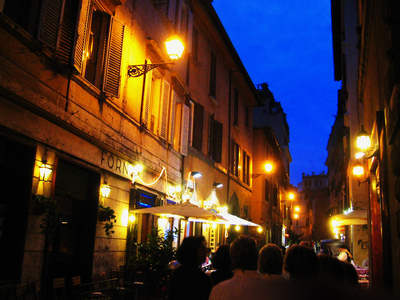 Other famous clubs in Rome are the ‘Gilda’ near the Piazza Spagna and the ‘Piper’ in the Via Taglimento 9. All 3 clubs open from 23:00 hours. Followers of jazz are well catered for at the ‘Alexanderplatz’ – the club has live Italian and American music to offer. One can listen and relax in the club’s restaurant or bar. The club is the on the Via Ostia 9 and can be reached via the metro – station Ottaviano. There are also numerous good bars and restaurants that are very popular with both locals and tourists. These include for example, the Caffée della Scala" in the Via della Scala 4 and the ‘Café Ombre Rosso’ on the Piazza Sant´ Egidio 12 – both are located in the Trastevere district. There are also good local ‘scenes’ located around the Campo de’Fiori and the Piazza Navona. As general advice it is recommended to take caution when strolling at night through an unknown city and to exercise common sense. Rome is not a hot bed of crime however it is better to be careful. One should for instance leave valuables like jewellery or a brand new ‘i-phone’ in the hotel safe. Women should ideally not go out alone. If one is not absolutely certain of the way back to one’s hotel, it is better to call a taxi. The few Euros that this may cost will save many hours of wandering through bumpy streets.